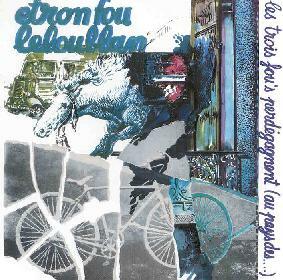 Etron Fou Leloublan - "Les Trois Fou's Perdegagnent (Au Pays Des...)"
Often in reviews or discussions you will see the term Rock In Opposition to describe a bands music. The term is used freely to describe bands playing more challenging avant-garde forms of progressive rock. In fact, Rock In Opposition was the name of a tour in the late 1970's organized by Henry Cow, and the participating bands, while all falling firmly in the avant-prog realm, were in most cases stylistically very different from one another. Etron Fou Leloublan was one of those bands and was one that had such a distinct sound that I often reference them as an analogy in reviews. Les Trois Fou's Perdegagnent was Etron Fou's second album and included the lineup of Guigou Chenevier on drums, percussion and vocals, Ferdinand Richard on bass and vocals, and Francis Grand on saxophones, melodica, flute, harmonica, cithare and vocal. This was the only album that Francis Grand was to play on, and I believe there was just one more before Jo Thirion joined with the keyboards that helped create what for me was the classic Etron Fou sound. The opening track alternates between the trademark quirky off-kilter bass and drum rhythms that characterized the bands sound throughout their career and trippy jazz fusion segments. Francis Grand's sax fits in nicely with Guigou and Ferdinand's vision, though the recorder and harmonica are a bit of a different touch. Among the guest musicians on the album is Verto, whose guitar kicks up the Rock element in the music several notches. And at one point Ferdinand's bass takes on a distinct Zheul sound. I love Guigou's distinct vocals... nevermind that I don't understand French. In fact, Etron Fou were one of the more song-oriented of the RIO bands (though Dagmar era Henry Cow certainly had it's share of songs). But along with the songs was music which was always challenging, captivating and truly fun. Kind of like an avant-garde circus band. In summary, while Les Trois Fou's may not be among Etron Fou's more exciting albums, I can heartily recommend it, and all their albums, as absolutely essential to the collection of any fan of RIO/Avant-Prog. Kudos to Gazul for reissuing this, and I see they've also reissued the bands debut album Battelages. With a little luck they'll work their way through the entire Etron Fou catalog. One of my fondest concert memories is of seeing Etron Fou perform in a warehouse in Atlanta, Georgia in 1986 on what I'm sure was their last ever tour. Ferdinand Richard was ill and couldn't make the tour so Fred Frith stood in on bass. Not a bad replacement ay?